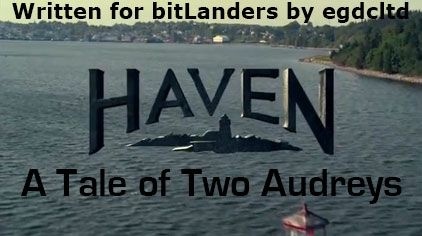 "A Tale of Two Audreys" is episode one of season two of Haven, a supernatural drama series loosely based on Stephen King's The Colorado Kid. In this episode, Parker and Nathan try to work out who the new Audrey Parker is. In the season one finale, "Spiral", Nathan had discovered that Chief Wuornos wasn't his father, but a recently released prisoner was. Then that man died, as it happens due to the chief, who was the one responsible for the cracks. Then the chief himself died, which wasn't a huge surprise, but it was his affliction that killed him, as he turned to stone and exploded. That was a surprise. The rev also wants to become the new sheriff. Vince and Dave are keeping secrets. Duke found out that there were many, many people with the maze tattoo or symbol, supposedly the one that's going to be on the person who kills him. Julia also has one, on her back, but it appears and disappears. 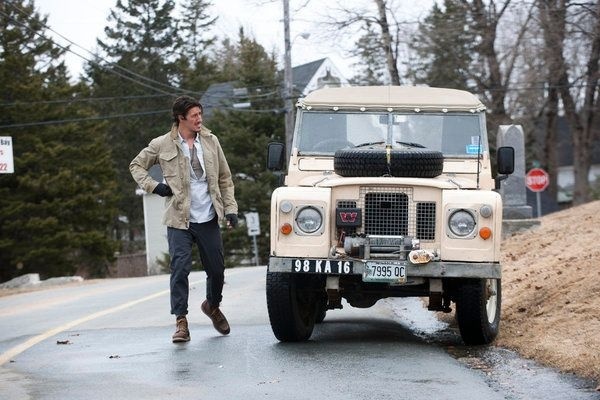 Finally, in a scene reminiscent to the one where Parker and Nathan met in "Welcome to Haven", the pair are approached by an FBI Agent. Special Agent Audrey Parker. Another one of them. So how come the FBI didn't notice they had two agents with the same name? Is Howard connected? Admittedly, Parker 1 also thinks she is Lucy Riley as well. The reverend has asked Duke to see him - he wants Duke to take his side. Duke wants to know what the tattoo means. Meanwhile, a boy is trying to get a paper boat out of a drain, when all the water coming from the sprinklers turns to blood. Nathan arrests Parker 2, as he doesn't know her. Parker 1 is definitely confused now. Then a rain of frogs happens (frogs which are quite obviously fake). Parker 2 is the first suspect, then a massive swarm of gnats causes a traffic accident in the town. Then there are flies. Sounds like a bunch of biblical plagues. Parker 2 says that her boss is Agent Howard, and seems to know some of the same things as Parker 1. Howard himself is heading to Haven. It looks like Parker 2 isn't responsible for the plagues, but the reverend is taking them as a sign. Duke is visited by an old acquaintance - who wants him to do a job. He isn't best pleased. The plagues are getting worst - and the last one is supposed to be death of first born sons. Parker 2 sounds just like a real FBI agent as well. She says the same about Parker 1. Some things are still hanging at the end of the episode.